This week has passed much faster than expected. I did not even get to meet all the friends I wanted to. Or even the friends I did meet I hardly had much time. Like Ian that I could only meet for a short breakfast before going to the airport. But at least I did a fair amount of cycling which makes me happy. On the flight back home to China we flew over Alaska. 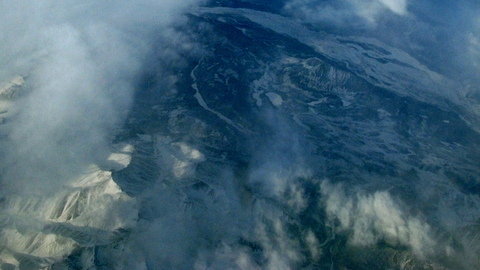 This picture does not really show how beautiful the white mountain peaks looked like from above. It is great to be back in China. I went right away to my neighborhood restaurant to have Xinjian food. This entry was posted on Freitag, April 10th, 2009 at 22:19 and is filed under China, USA. You can follow any responses to this entry through the RSS 2.0 feed. Both comments and pings are currently closed.